No I haven’t gone crazy (well I have, but that’s another story) and I know that Harriet Carter is only for Wednesday’s, but I saw the absolute brilliance in the fact that I got a promotional email from Harriet Carter late last night…Wednesday. I thought it was fitting that Harriet would send out her emails technically on Happy Harriet Carter Wednesday! Very fitting. As you can see, clearly Harriet feels that you’ll need lights in your yard this summer. However, normal lights won’t just do. No, no. 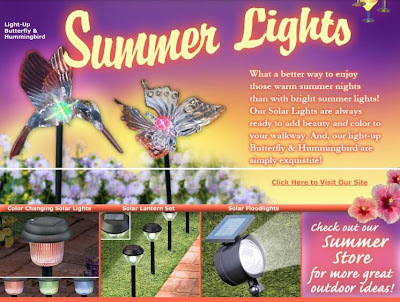 You need solar lights in the shape of birds and butterflies. Is she kidding? Seriously, it kinda looks like she just used the Bedazzler on a cheap crystal bird that they used to sell in the middle of the mall in 1991. Oh wait, she did. You know what Harriet? Go light up your own yard. That crap attracts mosquitos and I don’t want to get bitten during my late night swim. Thanks for bringing back Triple E (EEE), Harriet.